We manage social media sites for business and organizations every day and it can be incredibly tiring to keep pace with the differences and specialties of each network. Social media can be an excellent way to experiment with your brand, but eventually you'll want to settle into utilizing social media as a tool in your business marketing arsenal. Ultimately, you'll need to focus your efforts on a small number of social media sites tailored to your industry and talents. Which social media site is best for business? There are countless social media sites and platforms available that you could use to market your local or small business. Deciding which platform to deserves most of your time on is an important decision as you simply can't put a proper amount of effort into each and every social media platform that exists. If you're an entrepreneur juggling many hats, social media may just be another hat to add to your rotation which makes it even more important that you make your time effective with the best choice. The best way to be effective with your business social media is to choose a single platform and give it your all. If you're really struggling to pick between a pair of social media networks, you may be able to be effective with a couple. Think about this decision as if every additional social media platform you and your business focus on dilutes the rest. You only have so much creative energy, time, and decision effort you can muster. Put that effort into the social media network that's most appropriate for your small or local business. This brings me to a suggestion which is going to go directly against the entire introduction to this article: try multiple social media networks. If you're following our Local Marketing and SEO guide, you should at least claim your NAP to build citations on the major social media sites. That gives your business a great opportunity to try each social media network. See if you can't find a workflow you enjoy and can stick with combined with a community where your customers or clients exist. It's a difficult balance: you don't want to be forced into a social media workflow you hate just because it's where your customers hang out. You won't keep pace with a process you hate. You can improve that process by finding web strategy experts to handle it, but you need to get a feel for what you like. 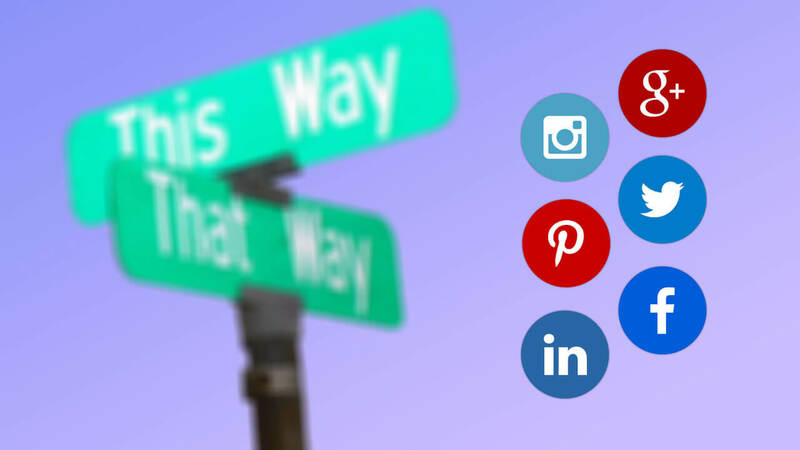 Try multiple social media platforms to see if a particular workflow resonates with you and your business goals. Each social media platform has its positives and negatives for local small business marketing. I'll walk you through the high level differences for each of the major six social media platforms and then give you details and actionable tips to apply to your strategy for each network. This overview will help you decide what social media sites for business are most effective for your time. Twitter can often feel like peeing into an ocean. I'm sorry for the crude metaphor but it applies so well. There's very little that can be done with your sole Twitter stream if you're an average user. The real customer reach of Twitter comes from combing streams from multiple participants. This leverage comes in the form of retweets. Your content needs to be engaging or useful enough that the bigger fish in the ocean of Twitter will give you a boost by sending your message out to their own followers. If you're just getting started with Twitter, my strongest suggestion to gain followers aside from connecting with friends, family, and existing clients/customers, is to attempt to engage with like minded businesses or users. Search for other accounts by location and give them a follow if you're at least tangentially related by industry, technology, or interest. Lots of average Twitter users will follow you back if you follow them. The folks that aren't going to follow your newly social business brand are those with massive ratios (for example: those following 50 people that have 50,000 followers). Following industry leaders is a good way to signify your niche or industry, but it's highly unlikely to produce any return follows to your business Twitter account. Aim to interact with other niche, peer businesses or individuals to earn your followers. Twitter is a space with an incredibly tall hierarchy of accounts. It's one heck of a climb. At first, engage with peers not influencers to be effective. Provide social proof by starting from the bottom and working your way up the Twitter totem pole. Whatever you do, don't bother with "buying" followers. They're not only useless in terms of engagement which is the entire point of what you're attempting to create with your Twitter account. Tweet frequently and utilize hashtags (no more than two per tweet) to give your tweets additional reach. Research the hashtags you're using to be sure they're relevant to the content of your tweet and used/seen by other Twitter users. You'll have far better luck creating engagement by targeting hashtags with smaller reach but which are more relevant to your tweet than using tangentially relevant hashtags with broad reach. Research by Socialbakers shows that engagement begins dropping off after 3 tweets per day for brands. Tweet frequently because Twitter streams move quickly and most of your followers or hashtag viewers will miss your first tweet. Use Pinterest's pin boards to create groups of useful highly topic relevant content. These are great targets for repins and shares. When creating pins, add Places to to them in order to market your pins in a local context. This enables you to conduct local business marketing through Pinterest. If your own location doesn't come up as an option, you'll want to make sure you're on Foursquare as it's the source of Pinterest's place data. Nearly everyone is on Facebook. It's the largest social media network today and counts such a large proportion of the Internet population that it generally represents your average Internet user. That means your business will be able to find an audience on Facebook. It also means you're competing with, well, everyone. You're probably already using Facebook for personal social networking and this can be a great springboard for your brand as you have an existing set of interested users. However, you'll want to think about just how much you want to market your business brand to your friends and family. Many business operators may choose to skip any personal Facebook account use targeting their business activities to avoid any objection from friends and family. If you're struggling to just get your social media presence off the ground though, this is probably the only audience you already have. It can be a tempting choice. If you're in this situation and decide to utilize friends and family to build your first set of likes for your Facebook business page, do it slowly. Create value in most of your Facebook posts and only occasionally mention your business brand, hopefully while still creating value for the reader. Facebook has large user groups which your personal account can join (most are moderated) to target a particular topic and discussion forum. Facebook groups can be an excellent source of discussion, feedback, and brand building but you need to stay on message. Remember to provide value and keep in the good graces of group moderators. Many Facebook groups are largely filled with spam. Aim for quality groups by reviewing the content being posted. Consider joining local groups that focus on business networking. Facebook business pages offer a variety of metric tracking which can be very useful compared to some of the other social media platforms. Facebook business pages also make it easy to start advertising through Facebook, leveraging the massive user base with fine-grained user interest targeting and detailed analytics. Whatever you do, don't consider buying "likes" on Facebook to get your business page started. Not only will your likes be useless in terms of actual engagement, which is what you're trying to create, but you'll dilute your engagement rate. Your engagement rate comes from the percentage of your followers who engage with your content. Facebook's News Feed (the primary place users will find your Facebook content) algorithm applies many factors to whether or not your posts will be seen by your followers. If you buy a bunch of useless likes and followers, you'll artificially dilute your own engagement rate, a factor that may be taken into account by the algorithm which could impact the reach of your posts to actual fans. Facebook's algorithms are always in flux, something you'll want to keep up with. At this point, the generally recommended update frequency is 5-10 times per week, or as often as you have truly engaging or timely content to share. The most important thing you can do on Facebook is to focus on engagement per-post, according to Moz's algorithm and Facebook post frequency research. LinkedIn offers quite a bit of guidance for small business use of the social media network. One of the most interesting points is about frequency, where their own internal metrics indicate that one post per weekday (so, about 20 posts per month) tend to reach 60% of their audience. Post consistently, and perhaps every weekday, but be careful not to spam an otherwise fairly quiet stream of professionals. Consider participating in LinkedIn's Groups. The Groups feature provides a way for users to engage with each other around a specific topic. This is a great way to expose your business content to other professionals, especially if it's in an area where tutorials, how to's, or guides may be appropriate. This is most common for knowledge-based business or services. Sharing knowledge builds your brand, shows you're the expert, and can attract leads trying to find that expertise. As with all communities, be wary of spammy marketing in LinkedIn Groups as they tend to be well moderated. Instead, deliver engaging, useful information that you would want to read. LinkedIn offers the ability to create full posts. These are not unlike a blog post and generally aim for long form content and can include inline media. These posts can then be shared on external sites or in Groups. Each post even has basic metric tracking. Feel free to post frequently to Google+ as your business page assuming you're creating or sharing useful, engaging content. This is especially true if you're contributing to communities. Communities are one Google+'s greatest assets. These large groups of users collect around specific topics or interests, a perfect place for you to find pre-qualified leads or simply folks interested in what you and your organization are interested in. Be wary of spamming communities as most are actively moderated. instead of delivering marketing messages, contribute meaningful, useful information. If your business' service or product so happens to relate to the topic at hand, it may make sense to link to it, but only on occasion. Google+'s Collections feature offers a way to group posts under a particular topic which can be followed by other users. Use this to categorize your posts and potentially collect new followers. Consider creating collections that focus on location as part of the categorization. Google+ allows for myriad sharing types, including direct YouTube integration which can be great to share video seamlessly. Link shares on Google+ will trigger Google to gather info from the target link, this indirectly can lead to Google Search indexing the link. If you have new content being shared, this is an excellent way to get the content indexed in Google Search results quickly instead of waiting for a search crawler to stumble upon it. I find Google+ link shares can trigger new URLs to be indexed within hours. Union Metrics, a social media analytics firm, collected information about Instagram post frequency and engagement with those posts as their frequency increased. Their research found that engagement tended to remain constant even upwards of several posts per day, so don't be afraid to share often to Instagram if your brand has quality content to share. The key reason I suggest moderate update frequency is that it's difficult to come up with quality visual material for Instagram much more than once or twice per day. Instagram is a visual medium and is generally a more casual, fun place to be. Remember this when using it to build your business brand. Think about experimenting with trending hashtags or contests. Use it as an opportunity to give life to your small business: show the people behind the scenes. People won't follow you or engage if it's a one-way street of product visuals and nothing more. Engage with your audience, show you're interested in your potential customers. Think about how people might use your service or product, show that happening. Give life and action to what you sell instead of a simple still shot of the product. I hope you found this overview of the six major social media networks and how they apply to local small business marketing helpful. I know deciding what social media sites for business to use is difficult. Your participation in social media networks is a ranking factor for local search engine optimization (SEO) purposes, not only as citations, but also as social signals indicating engagement to the search engines. Now is the time for you to get started: pick a social media network and begin experimenting. Did reviewing the pro's and con's of a particular social media site spark your interest? Get started on that network with your business brand while you have the interest! Connect with us when you do, I'd love to hear your thoughts! If this helped, consider sharing this article to encourage us to keep giving you more actionable guides!